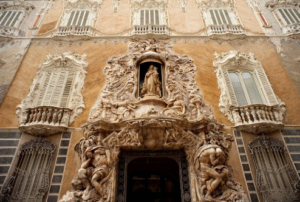 Founded by Gonzales Marti, a passionate ceramics collector, the museum is housed in one of the most architecturally impressive buildings in Valencia. This rococo palace, closely related to the baroque, stands on the former home of the Rabassa de Perellós, Marquis de Dos Aguas in 1740. Founded in 1947 as The National Museum of Ceramics and Decorative Arts, “El González Martí” from the donation of Manuel González Martí’s ceramics collection, is dedicated to ceramics, porcelain and other decorative arts such as pieces of furniture, clothing, and paintings, with a special focus on Valencian tradition and local artists. 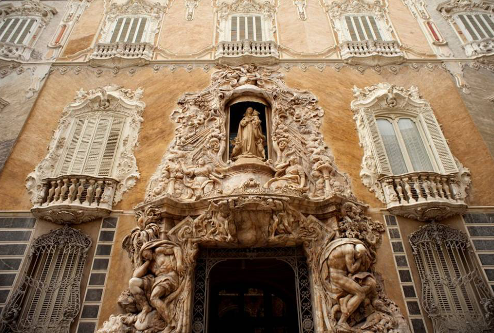 Made all in alabaster by the Valencian Ignacio Vergara, the composition of the magnificent front of the palace refers to the two largest rivers in the Valencian region: the Turia and Júcar, represented by two naked human figures; beside them water flows down alluding to the title of the Marquis. On top of the door the shield of the Marquis is carved, and in the highest niche, the life-size image of Virgen del Rosario, chosen as patroness, is shown. 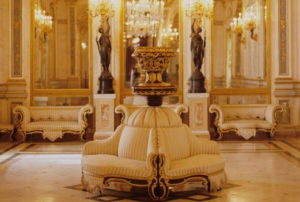 It was declared a historical-artistic monument in 1941 and is mostly dedicated to temporary exhibitions.